Here’s a crazy thing. I was just looking through some of my digital notes (I tell you my notes are everywhere!) and I came across this picture of a whiteboard diagram I did for one of the stories. What you see illustrated here is one story told through the relationships of the characters. This is how I work when I get stuck. I am definitely a pantser, but that doesn’t mean I won’t try plotting before I write a story. I did, and it didn’t work in this story’s case. I knew something was off. 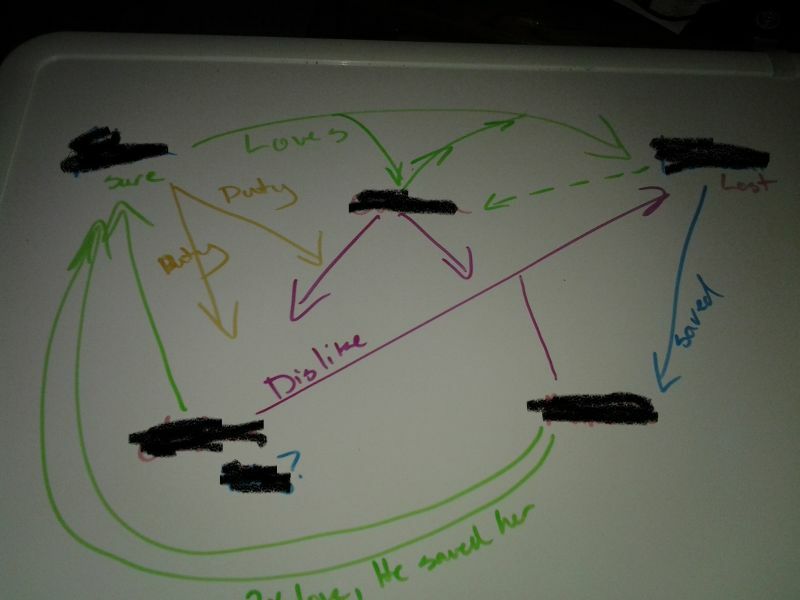 Rather than look at the planned events for the story again or continuing to just stab around looking for the story through writing, I decided to make a diagram of the character relationships. To other writers, this probably doesn’t sound that crazy, so I imagine this is more of a post for readers. A behind the scene look at the things that are tried in order to understand a story better. In my case, I feel that my writing focus (my story spirit) will always be contained within the personal relationships of the characters. Though I hope to always write an engaging story with a satisfying ending (which doesn’t always mean a happy ending), the most important thing to take away from any of my stories will always be these relationships. My whole thing is exploring normal people in an extraordinary world just to see what normal people can do when pushed. I don’t believe people know what they’re capable of until they are pushed. Anyway, I thought this would be fun to share. I’m still working on this story. After I did this diagram, I let the story stew while I went back to edit an older story. When I came back, it all became so clear to me I wrote the first-half draft in a week. I say first half draft because I managed to get the events down, but I need to work on layering in the personal relationships. Because that is the important part to me after all. So just a question of curiosity, what do you consider your writing focus/story spirit? Do you find it changes with the story or is there something that you’re always focusing on?